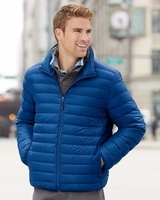 Weatherproof - Packable Down Jacket (15600) 100% 380T high-density nylon. 90/10 duck down/feather filling. 550 fill-power. Water- and wind-resistant. Zip-front placket with stand-up collar. Elastic windproof cuffs. Front pockets with side entry. Interior pockets. Folds and stows into separate pouch.